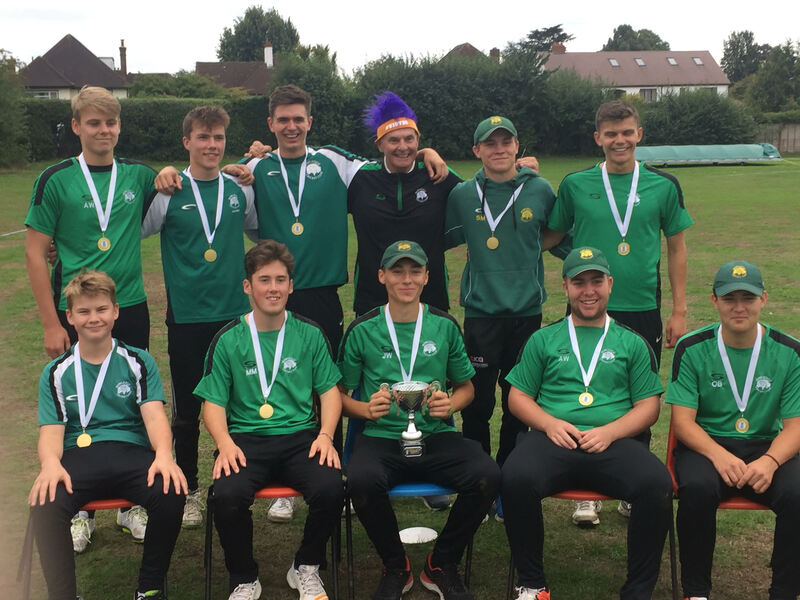 Rowledge Renegades won the Surrey Tier 2 under 19 competition at their first attempt at Cheam CC on Bank Holiday Monday. It turned out to be an exciting 4 run win in a tense exciting affair played in a great spirit by both teams and worthy of a Cup Final. Rowledge winning the toss and electing to bat first on a damp track track was a brave decision but openers Martin and Wilson got off to a flyer with some big hitting in the 6 over powerplay and with the help of wides were 60 for no wicket after 7 overs. The fall of Wilson brought Toby Elstow to the wicket and the run rate continued at a pace with him and Max Martin playing some expansive shots got to the century after 11 overs. When Martin was caught a mini collapse took place and the Renegades lost 5 wickets for 10 runs and the target which looked to be around the 180 mark reduced significantly reduced to the 140/150 figure. The tail wagged slightly with Baker, Anderson and Foskett managing to crawl the total to 139. The two Hafiz and Fleming were the stand out bowlers for Horsley and they gave the total a competitive but gettible look. With the wicket drying out and uneven bounce the target of 140 was always going to be a test. A couple of early wickets gave momentum to the Rowledge fielders but then a significant and entertaining partnership by Hafiz and Collett swung the game in Horsley favour, their stroke play and hitting in fast time had the Renegades fielders scampering to all parts of the ground. It was the breakthrough by Jack Cantwell by bowling Collett that changed the game. Small but telling partnerships saw the Send total creeping up to the target until they needed seven runs to win off the last over. Captain Wish stepped up to the plate and consistently beat the bat and with 5 runs off the last ball needed to win finally gave the game to Rowledge with a single. The Renegades successfully defending the total of 139 by 4 runs came after winning the West group including wins against Bagshot, Camberley and Grayswood. An enjoyable tournament played at a good standard with over 20 players used in the games. A resounding success at this age group.